New Age of Taurus album “Desperate Souls of Tortured Times” is now available for pre-order on vinyl. Ships on or around 9/30. Import from the UK. New and never played single LP (vinyl color unknown). 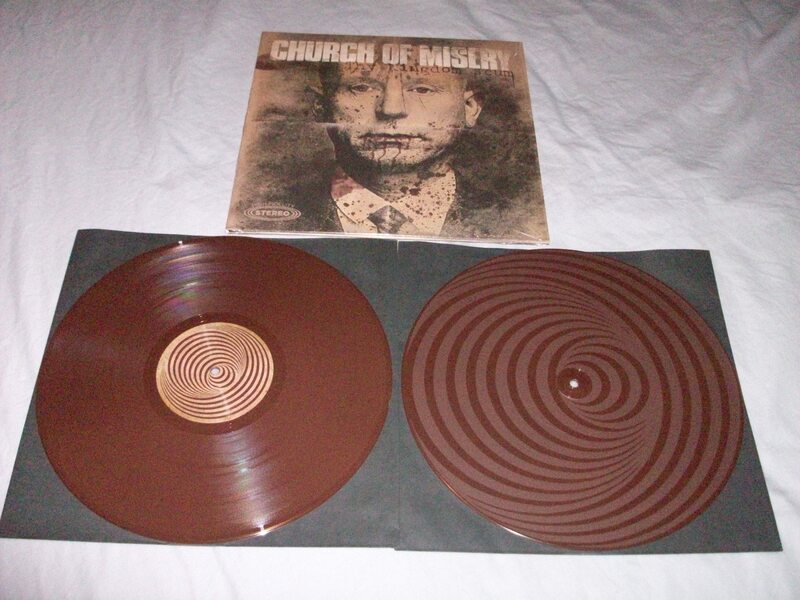 Church of Misery’s new album “Thy Kingdom Scum” now available on blue and brown vinyl! Import from the UK. New and never played double LP from Rise Above Records. “CHURCH OF MISERY was founded by Tatsu Mikami (bass guitar) back in 1995. After the breakup of his leading thrash metal band SALEM, a band that had toured in the UK several times and received critical acclaim from metal fans and press alike. Tatsu decided to start his own solo project. He wanted to do something that reflected his other musical inspirations – doom metal and doom rock. Apart from metal and thrash, he was strongly influenced by doom bands like SAINT VITUS, BLACK SABBATH and became aware that his own riffs had started to include doom vibes. Also, he was very much into late 60s/early 70s heavy rock material like LEAF HOUND, NOVEMBER, MAY BLITZ, HIGH TIDE, GUN, BLUE OYSTER CULT and so on. It was natural for him to shift his musical direction from metal to a more rock-influenced style. 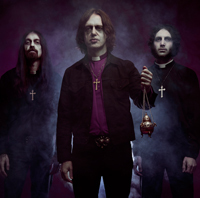 Since then, Church of Misery have gained a cult reputation around the world, frequently touring in Europe/US and have shared the stage with famed and infamous western bands such as SAINT VITUS, CATHEDRAL, EYEHATEGOD, ELECTRIC WIZARD, ORANGE GOBLIN, FIREBIRD, THE GATES OF SLUMBER, DEATH ROW, ANGEL WITCH, etc. etc. Also, they have appeared in renowned metal/rock festivals in Europe/USA such as Roadburn (Holland), Hellfest (France), and Maryland Deathfest (USA) to date. Uncle Acid & The Deadbeats new 7″ single Mind Crawler now available for pre-order. Release date is 8/19/2013, I’ll have my copies about a week later unless product is delayed. Import from the UK. New and never played 7″ (vinyl color unknown). “”Mind Crawler” is the second single from Uncle Acids critically acclaimed third album, Mind Control. It features an exclusive b-side, Get on Home, which is a brand new recording of a song originally written and recorded by their hero, Charles Manson. New Blood Ceremony album “The Eldritch Dark” now available on opaque gold in red vinyl! Import from the UK. New and never played single LP from Rise Above Records. Deluxe gatefold vinyl with metallic lettering. “Since the release of their sophomore album, LIVING WITH THE ANCIENTS, Blood Ceremony has worked hard to solidify their reputation as a worthy live act. Beginning with a well-received showcase at the prestigious Roadburn Festival, the band capped-off a series of 2011 European dates with Swedens GHOST, playing a sold-out, headline show in London, UK. In the fall of 2011, they completed their first headlining tour of Europe, which saw the band received enthusiastically by fans in Scandinavia and Central Europe. This tour culminated in a performance at the Hammer of Doom VI Festival in Wurzburg, Germany. In 2012 they were direct support for GHOST on the highly successful “13 Dates of Doom” North American tour. Later in 2012, BLOOD CEREMONY performed at Calgarys celebrated NOCTIS V Metal Festival. After these live performances, BLOOD CEREMONY enclosed themselves within a dank, tomb-like chamber to begin preparations for their third album. After a mind-numbing spell in the analogue womb of Toronto’s ProGold Studios, the band is now ready to unveil their newest, and most accomplished, musical offering: THE ELDRITCH DARK. Recorded and mixed by producer Ian Blurton (Cauldron, Cursed) and mastered by Canadian recording legend Nick Blagona (Deep Purple, Rainbow, Crazy World of Arthur Brown), THE ELDRITCH DARK is a full-length paean to the darker corners of folklore and legend. Containing eight tracks of black magic rock ‘n’ roll, the album crackles with the excitement of a nocturnal ritual. The New Purson album “The Circle & The Blue Door” from Rise Above Records is now available for pre-order on vinyl. “There is a magic place where folky warmth meets lurid technicolour horror, where progressive rock complexity and all out skull-crushing doom combines with classic songwriting to flesh out a sinister but romantic vision of twisted dreams and lurking threats hidden just out of view. That place dwells in the debut album by Purson. The Circle And The Blue Door finds the missing link between Pentangle and Pentagram, by way of David Bowies dream reality and The Beatles feel for the perfect melody. And while it owes a debt to front woman Rosie Cunninghams clear love of the late 60s and the early 70s, it is her poetic, evocative lyricism, tight song craft, sonorous vocal style and dedication to deep musicality that takes this wonderful album far beyond the waters of pastiche.